Winter in rural New England is never an easy time. The days are short, the weather is bone-aching cold and there’s all of that snow to deal with. Race teams, drivers and fans also know that it will be months until they get back to the racetrack. 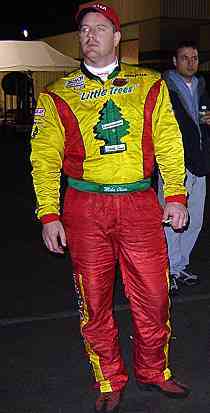 This December though has been especially tough for Busch North driver Mike Olsen. It wasn’t supposed to be that way either. Olsen took the checkered flag in the prestigious NASCAR Toyota All-Star Showdown at Irwindale Speedway (CA) last month in front of a live television audience, thousands of fans and a suite packed with guests of his sponsor, Little Trees. For the next little bit, life was good. Then came technical inspection. That is where it was discovered that the wheels on Olsen’s car did not meet NASCAR rules. They were too light. They were too wide. They definitely weren’t what should have been on the car. Olsen doesn't deny that. In the days after the race, Olsen would be penalized and moved into the final finishing position. He would have to make some tough choices with his race team, releasing longtime crew chief and childhood friend Harry Norcross as a reaction to what happened. He would have to face his sponsors, fans, neighbors and fellow competitors. The events have turned what was Olsen’s biggest career victory into his biggest racing headache. Olsen’s #61 team took it hard too. Torn up and torn apart. On the same day that NASCAR announced the penalty, Olsen announced that Norcross was relieved of his duties with the team. Letting a friend go, even when he was the one responsible for the wheels, wasn’t easy. Things could be patched up enough for Norcross to come back to the #61 team in the future. Olsen does not dispute that the wheels were illegal. When he was told of that problem before leaving the pit area at Irwindale, he was surprised to find that the wheels in question were on his car. He expected a large fine for the infraction, but did not a disqualification. Olsen maintains that he did not have any knowledge that they were on the car. He was even surprised though that his win was taken away. There wasn’t much precedence for that. Brad Leighton was caught with an illegal carburetor at New Hampshire in 2002, but his victory stood. In NASCAR’s three top series, everything from lowered cars to oversized engines have resulted in big fines, but no reversals of victories. Olsen made those points in his appeals hearing with NASCAR in early December where four-time defending Busch North champion Andy Santerre served as a character witness. The penalty was upheld in the hearing, but Olsen was thankful for the support from his fellow competitor. 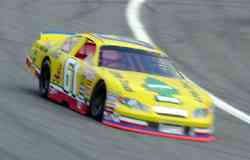 Olsen's #61 from earlier this season at New Hampshire. Olsen (C) has received the support of many of his fellow competitors since Irwindale. Santerre isn’t the only one who has stepped up to support Olsen. Several competitors have called him over the past month. Olsen is also thankful for the support that he has gotten from his sponsor for the past decade, Little Trees. That damage control, and the situation as a whole, has taken a lot of joy out of racing for Olsen lately. Olsen doesn’t plan on hanging up his helmet though. And being back behind the wheel with the Irwindale race a distant memory might be exactly what Olsen needs.